This summer, SIMS sent a team of 7 students to Atibaia, Brazil. Those students were Bobby Cranston, Skylar Blackburn, Katie Trivillino, Hazel Brooks, Jana Seymour, Megan Howell and Claire Kroeger, who were led by Mike Redwine, Vice President of Student Development. There are several reasons why this trip was different from the many other SIMS trips that went out this summer. 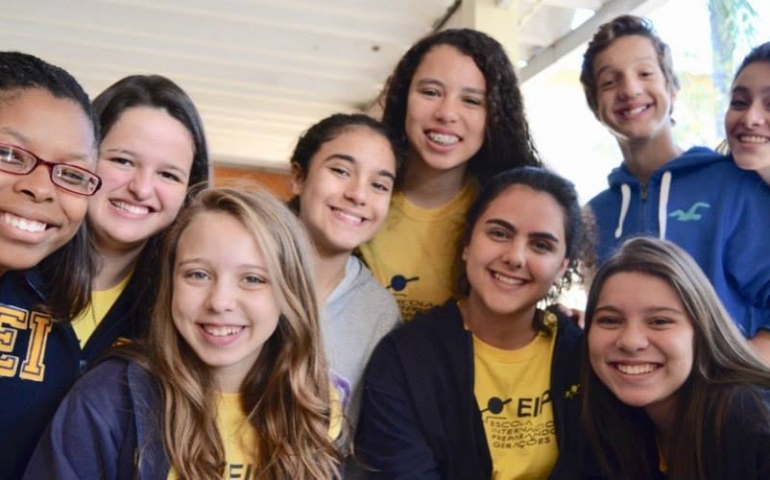 When they first arrived, the team focused their time and energy at EIPG, a grade school in Atibaia which is run by the mother of one of our own students at SNU, Felipe Simoes. EIPG is a Christian school; however, “it’s not a typical Christian school,” said Simoes, senior, who attended as a child and is still involved. The school is active in teaching their students biblical values and good character traits mainly outside the classroom, holding Bible studies during their lunch hour and planning time in the morning for character lessons. EIPG is also a growing, bilingual school. All of the students take English classes along with Portuguese classes. For many students, being bilingual in Portuguese and English is very important for them after school when they try to find a job. Because everyone spoke English for the most part, real friendships grew between the team, the students (young and old) and the teachers, without language being a barrier for them. The team spent some time helping out on location at the brand new high school building that the students in Brazil have now moved into for the new school year. The SNU students on this trip also had the unique opportunity to become part of a family in Brazil. The families of the students at EIPG opened their homes for each SNU student, enthusiastically sharing all that they could about Brazilian culture. Claire Kroeger spoke about the interesting dishes she tried and how comfortable she felt around the people she met. “Even little twelve-year-olds can have the biggest impact on you and you wouldn’t know it,” said Kroeger. Spending time in their homes made the relationships so much stronger in such a short period of time. The people of Brazil were wonderful hosts for the team outside of their homes as well. Teachers invited them into their classrooms where they discussed cultural differences, played games and shared testimonies. Families integrated their SNU students into their daily lives. The whole school came together at the end of the trip to throw a party in honor of their American guests. Relationships quickly formed between the EIPG students and the SNU students. If you would like to know more about these team members’ experiences, they would love to sit and talk about who they met and why their time in Brazil was special. You can also go on your own SIMS trip next summer and have a great experience of your own.